Welcome to All American Awards, Inc. website. Not only do we have this website, but also a showroom in Mount Pleasant, SC (right outside of Charleston, SC) to show some of our custom trophies and awards. Our showroom hours are from 8:30am to 5:30pm Monday - Friday. All American Awards, Inc., was founded in 1993. We are a trophy shop that specializes in the production of custom designed recognition products for both Corporate and Sports awards customers. We provide custom crystal awards, recognition plaques, acrylic awards, sports trophies, sculptures, medals, name badges and bronze plaques. 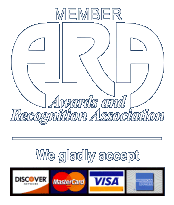 In addition to recognition awards, we produce banners, signs, donor recognition walls, rubber stamps, ceremonial shovels, custom lapel pins, custom challenge coins, promotional products and just about any other item on which you require a name or logo. Please feel free to contact us if you do not find a product on our website that you are searching for. We may stock it or be able to create or find it for you. Thanks for checking All American Awards, when you recognize excellence.